I know what some of you are thinking. Eggs are for breakfast, and pizza is for dinner, and never the twain shall meet. I used to think like that. There was a time, early in my career, when I was a culinary fundamentalist. Chocolate was a candy, and not something one added to a sauce for short ribs (see post below). But, like all fundamentalists, I was missing out on a lot of pleasure. So, if your rigid belief system prevents you from giving this pizza a spin, then it's your loss. This is a truly magnificent pizza. I first saw pizza topped with eggs in the Chez Panisse Café cookbook. 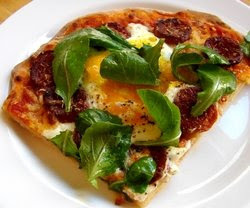 Alice Waters, the chef of Chez Panisse, and one of my personal heroes, used eggs to top a similar pizza using proscuitto instead of sausage. I decided to try it, and it was a transcendent experience. The golden yolks oozing slowly over the spicy sausage and melted cheese is TDF (to die for). I hope you give this a try. Which reminds me to warn you that it may take a few tries to achieve the perfectly cooked eggs. But, when you do, there is bliss. Enjoy. You got Pizza Sauce on your site...in fact, I remember it as the same post as your dough's! Yes, the dough link takes you to all 3 parts of the pizza post. I guess I should link that ingredient also. Thanks. hahaha, you like your eggs like you like your women huh? whoa thats aweome chef! eggs on a pizza sounds like the tastiest things ever. i've actually seen this before on a flyer for dominos when i was in japan. ps that was a joke right? bring it up a notch?...rachel ray?...right?? Wow, That's next on my list of things to try from your site. I had eggs on pizza once while in Paris and didn't like it - but the whites were very runny. This version looks way better! BTW, my kids are still raving about dinner last night - the Chicken Parm Bake. That's going tbe used a lot around our house, I bet. I last saw an egg on a pizza when I was on my honeymoon in France 18 years ago. We were at the beach in a little resort town called Mimizan-Plage in the southwest corner of France. The pizza we ordered had red and green peppers, mushrooms, artichoke and a single egg in the middle and get this - the pizza was called a "California Sunshine". Request - while you are on the subject of nonconventional pizzas - would you please demo the wonderful pizza with thin sliced potatoes on top? I had it once in SF, and have never seen it served anywhere since. No Corned Beef and Cabbage for me - this is what I want for my St Pats dinner. That does look rather good - I love Alice Waters! I met her, and she is just as much a genius in person! The television shoe "The Odd Couple" once had an episode where the character Oscar ("the slob") ordered pizza with fried eggs on it...maybe he was really a misunderstood gourmand? glad to see someone else spreading the word of egg on pizza. i'm a huge fan. even have an alternative method as well to be used with deep dish chicago style pizza. take left over slice of chicago stye deep dish pizza and warm one broiler to heat adn get cheese a little crustier and to toast the crust a little more(pay close attention not to burn the crust). while doing that, poach two eggs. take out the pizza, place poached eggs on top, add some fresh black pepper, grate some fresh parmesian cheese on top, and add a couple dashes of freshly chopped basil. that's my favorite breakfast! OH MAN its emeril lagasse not rachael ray!!!! Thanks I had no idea... emeril is the EVOO guy, right? 14 minutes at 475???? Are you sure about that. I've made many pizza's at home and in my experience it would be one crispy critter after that. I love the idea of the eggs on it! That sounds absolutely delish! I'll have to give it a try soon. That what it takes for me to get a nice crust 12-15 minutes depending on toppings. I just made this pizza for dinner tonight - outstanding! Thanks, Chef John!!! Very wonderful Chef John! My Mom was very surprised by this dish, she doesn't like sunny side up eggs, or fried, but she turned out to love this dish! I was wondering if you could substitute proscuitto instead of sausage like the previous recipe you talked about had. DId you just like sausage more so thats why you substituted? Thanks! sure, it's great with any meat, whatever you like. Fantastic video! I've been googling to figure out when to add the egg. Thanks for all the pointers. I grew up in Brazil where we have our variation of sausage and eggs, it's cooked with a lot of sauce. I think it would be perfect on top of a pizza., You've inspired me! Thanks Chef John! I made this pizza for a Sunday night's dinner and both my mom and dad (and me!) loved it. 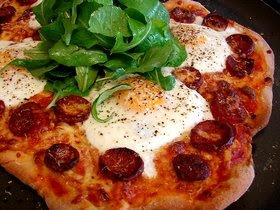 Neither my parents are big on pizza but this egg 'n pizza combination certainly won them over! OH WOW!!! I gotta' try this on the grill. WOW! pizza with eggs is a common here in vienna austria. they sell it with spinach or ham... delicious !! Long time since any comments on this one, but I just ran across this. So has Emeril sued you yet for misappropriating his signature phrase?